17th Century Large Onion Bottles, reproduction glass bottles for pirate and colonial use. Late 1600 - 1700's round bottle stored oil, vinegar and wines. Includes cork, Hand Made from Green Glass, can be used in the modern kitchen. 17th Century Small Onion Bottles, reproduction glass bottles for pirate and colonial use. Late 1600 - 1700's round bottle stored oil, vinegar and wines. Includes cork, Hand Made from Green Glass, can be used in the modern kitchen. Re-enactors like to use fur when possible, because there's nothing more authentic for almost any nation at any time. Beautiful, high quality Reindeer Fur from Finland is just the ticket and gives you a real sense of history. Here is the Cutlery Set with pouch. Very rustic hand forged (2 prong) fork, knife and spoon set. Comes with a leather pouch to store the set in. A new heavy duty, quality leather drink holder (for cans, cups or bottles) with an adjustable, leather thong mounting system. Design allows you to easily attach the holder to your Belt. Patterned after original tools from the middle ages these hand Forged Chainmail Tongs were used by medieval armourers to close the ends of chainmail rings. 10th - 15th century. Functional and correctly shaped medieval Iron Table Knife. Hand forged and sharpened this knife will satisfy the needs of living history groups as well as re-enactors and collectors. Our Flat Medieval Cooking Pot 10 Quart size has the same features as our cast iron Medieval Cooking pots. This Flat bottom Cooking Pot includes a well-fitted lid and carrying handle. Pre-seasoned with flaxseed oil and made from pure gray cast iron. Our Fleur de Lis Stoneware Drinking Mug is a colorful Stoneweare mug with a pleasing bell shape and Fleur de lis design. Appropriate for recreating the time periods from the 1600s to 1800s. Our 5" Horn Drinking Cup was a common early accessory was a simple cup fashioned from cow or buffalo horn. It was easy to carry in a knap- sack, inside a hunting shirt, a pannier or a saddlebag. The Flint Striker Knife is a rustic, hand forged piece. A great addition to your medieval dining ware collection. Great for starting your cook fire. The Horn Drinking Cup was a common early accessory that was a simple cup fashioned from cow or buffalo horn. It was easy to carry in a knap- sack, inside a hunting shirt, a pannier or a saddlebag. This medieval candle holder is a hand forged candlestick holder made from iron. Makes a great accent piece for your medieval decor or medieval camp. This large Medieval Cauldron is forged from iron and constructed with large rivets which are bolstered by seam welds. The iron swivel handle is fitted to iron rings. This Medieval High-Backed chair is constructed from robust hardwood (seasoned mango wood) and is ideal for your Medieval feast or room - or as the Throne in your reenactment or roleplay. For the reenactor on the go. Our set of forged Medieval Eating Utensils, knife, fork and spoon fits into their own tie fold-open belt pouch for a great combo that is easy to take along to the fair, picnic, campout or wherever you want to be able to eat out! Includes leather pouch (not sold separately). Hand forged Medieval Chest Hinge. Medieval Cooking Tripods are heavy duty for holding small, medium or large cast iron cooking pots. These iron tripods are a perfect accessory for our Medieval Cooking pots designed for medieval period cooking. These Medieval Cooking Utensils are historically accurate and shaped correctly. Hand forged, fork, large spoon. The iron knife is sharpened and quite capable of cutting meats of flesh. This Medieval Caldron is historically accurate and shaped correctly. Hand forged from wrought iron, this cooking pot will hold 2 quarts of liquid. The cauldron is also available in a 2-gallon size. 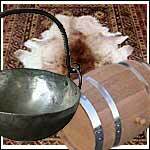 Our Medieval Cooking Pot 2 Gallon size adds a bit of realism to your medieval camp. These cauldrons are designed to be used over an open fire (or gas burner). This size Cooking Pot includes a well-fitted lid and carrying handle. Our Medieval Cooking Pot 2.25 Gallon size adds a bit of realism to your medieval camp. These cauldrons are designed to be used over an open fire (or gas burner). This size Cooking Pot includes a well-fitted lid and carrying handle. Our Leather Drinking Horn Carrier provides a great way to carry your drinking horn. Comes with Celtic knotwork design. Our Leather Drinking Horn Carrier Deluxe is an even better way to carry your drinking horn. Comes with intricate Celtic knotwork design. What better accessory is there at the Faire than a mug strap? Ours is of heavy leather and will fit up to a 3" belt. While there was no such thing as a watch in Medieval or Renaissance times, today one is required to be at certain places at certain times. Customizable to match your attire, this watch strap helps keep you on time without ruining your look. Made in the U.S. of top quality leather, this mug and watch strap is a must have for period faires and events. Keep track of when to get to the next joust, and have your tankard ready for a drink in one great looking accessory! This Medieval Cutlery Set is blacksmith forged in blackened stainless steel to minimize maintenance. Supplied in an attractive leather pouch with a belt loop, these period utensils are made to be used and work well. Our LARP foam-Dagger Scabbard is made of leather and features a velvet lining to protect the blade of your LARP Latex-Dagger. Scabbard attaches to your belt. Our Accessory Holder is great for attaching all your Medieval necessities to your belt. Perfect for pouches, LARP swords and daggers, tankards, books, etc. With our Medieval Fork and Spoon you can freely enjoy your Knightly meals. Each is rustic and hand forged for that authentic look and feel. With our Medieval Fork and Knife you can freely enjoy your Knightly meals. Each is rustic and hand forged for that authentic look and feel. Medieval Cooking Tripods are heavy duty for holding cast iron cooking pots. These iron tripods are a perfect accessory for our Medieval Cooking pots designed for medieval period cooking. Our Medieval Cooking Pan is styled after the pans that were used back in the medieval era. Made of iron, and great addition for you medieval re-enactment collection. Our Large Renaissance Skirt Hike is made with extra large rings to accommodate the thicker fabric used in many Renaissance gowns and wench skirts! Skirt Hikes are used to keep your skirt out of the mud and are easy to use! Medieval cutlery set with pouch, an ideal piece of equipment for any role player. Three piece set comprises a spoon, knife and fork from forged twisted stainless steel. Comes complete with a practical leather carrying case that fits most belts. Large Medieval Cooking Tripods are heavy duty for holding small, medium or large cast iron cooking pots. A perfect accessory for our Medieval Cooking pots designed for medieval period cooking. Pulley system easily raises pots. Reproduction Large Rum Bottle from Hand Blown Glass. Perfect glass bottles for pirate and colonial era use. Used to store water or rum. They stand approximately 10.5 inches tall. Imported. Includes cork, can be used in the modern kitchen, as well as camp. This Medieval Cooking Fork, is an ideal piece of equipment for any role player. The fork is made of hand forged twisted iron. This fully functional medieval or Renaissance candlestick is crafted from iron. It is stabilized with a tripod leg base and it is ready to bring old world ambiance to your home or camp. The Roman Legion Canteen is a Steel canteen with brass fittings. Accurate Roman Gear! Our Medieval Kettle is a case iron Cooking Pot and includes a well-fitted lid and carrying handle. Pre-seasoned with flaxseed oil and made from pure gray cast iron. Great for Medieval re-enactnemts or camping trips! Renaissance Leather Skirt Hike, used to keep your skirt out of the mud. It has never been easier than using our Skirt Hikes! Use two in front for a too long skirt, or use one to show off a colorful petticoat or even (gasp!) a trim ankle. Our Medieval Style Wooden Spoon is carved from solid hardwood. This spoon replicates a typical early medieval eating utensil. This Medieval Style Lantern is crafted in blackened steel with translucent horn panels and a ring to attach a carrying stick (not included), made for use with a candle. 8 inches in height, 3.5 in square base. Re-enactors like to use fur when possible, because there's nothing more authentic for almost any nation at any time. Beautiful, high quality Sheep Fur in Black is just the ticket and gives you a real sense of history. Re-enactors like to use fur when possible, because there's nothing more authentic for almost any nation at any time. Beautiful, high quality Sheep Fur in White is just the ticket and gives you a real sense of history. Roman Legion Cooking Pan, or Patera, is a newly redesigned Roman cooking and eating pan. Accurate Roman Gear! Medieval Set of Eating Utensils like these, which closely model those widely used from the early Iron Age to the Middle Ages, had to compete with the convenience of fingers. The handle for each hand-forged piece is given the traditional blacksmith's twist. Knife is capable of holding a good edge. This set of Prison Keys includes five iron keys. Great if you're a castle guard in a prison, or a pirate locking up the arms. These are the keys for the job. Here is our Roman Situla. Situla, from the Latin for bucket or pail, is a term for a variety of elaborate bucket-shaped vessels from the Iron Age to the Middle Ages, usually with a handle at the top. This Roman Stove is an excellent camp item. This heavy duty Roman stove has places to heat water in addition to the grill. The grill cross braces move. The Roman Leather Bag is skillfully patterned after the ones seen on Trajan’s column. Every soldierly reenactor will want one of these items to hold personal gear. Here is the Medieval Kitchen Knife, a very rustic and hand forged piece. A great addition to your medieval dining ware collection. Here is the Medieval Kitchen Knife, a very rustic hand forged piece. A great addition to your medieval dining ware collection. Medieval Lock Plain is a perfect accessory for your medieval display or historical re-enactments. Hand made steel, these medieval locks include a key that turns to lock. These plain locks also suitable for Renaissance and Pirate eras. Royal Seals of the Crusades - Set of Four. We have gotten numerous requests for a set of royal seals. This first series, expertly made by Marto of Spain, is based on ones used during the Third Crusades. Each of these round seals can be screwed into the wooden handle and be interchanged in seconds. The Chakki or Roman Grinding Stone was a hand mill used by Roman legionaries to grind grains. This Medieval Bench is crafted from stout hardwood components. This medieval bench will make a great addition to your medieval decor or medieval camp. Hand forged Medieval Iron Hinge.